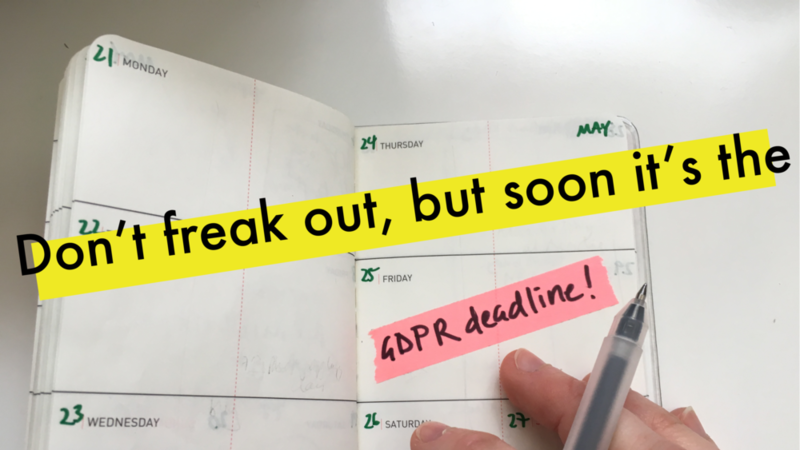 With the GDPR deadline only 17 days away I thought I’d do a bit of extra research for you, so that if you’re feeling a bit overwhelmed with it all you know where to go for the right guidance and information. Please be aware that everything I put in this post is only information I have gathered from a variety of online sources and it does not constitute legal advice. You must do your own research and get up to speed for yourself. I’m merely here to signpost the way and highlight things you should probably know and need to find out. It’s been a little while since we talked about writing-specific issues here on the blog, so I thought I’d return to something I’ve mentioned before and which I get asked about again and again – whether to write your artist’s statement in the 1st person or 3rd person. In my opinion it doesn’t matter which you choose so long as the writing suits the audience you are writing for and the work that you make (see my post on this topic). You can write a superb artist’s statement, that sounds professional and engaging, in either. So, let’s assume you’ve thought about who and what the writing is for, and have decided which point of view works best for your work… and it’s the 3rd person. Now what? Here are some tips to help you get started and write that awesome artist’s statement. There has been an undeniable shift in mood during the last week. Some days it seems I can perceive the light changing and the weather shift. Although not cold, the mornings are chillier and I can no longer pretend that the evenings are balmy and long. A new season is here. Every year I try to remind myself not to grasp, not to try to hold onto time beyond what is natural. Summer passes into autumn and it is right that it does. Whether I feel ready or not is beside the point. This year, I am more aware of the French notion of la rentrée. This season, which goes beyond merely ‘back to school’ at the beginning of September, infuses life at this time. It is a return. A return to life as normal after the long summer. Now, this probably makes more sense for a country which definitely experiences a long hot summer, and which almost closes up shop for a month or two. This return is a very real thing. Children return to school, adults return to work, politics gets going again, the media begins a new schedule and even the literary world joins in, launching hundreds of new titles. But, I think it is also something which we can embrace, psychologically, as creatives. When you are communicating about your work through writing, the goal is to find the voice that best expresses your ideas, a voice that sounds authentic. Usually this is your own voice – the voice that sounds like you. It’s so much easier to write in the way that you would naturally talk and it almost always sounds better to the reader. So, once you have found your voice in your writing, you would think that when it comes to communicating verbally, in person, things would be easy. But somehow confidence gets lost and the authentic voice that you’ve harnessed on the page disappears. So often this comes from the anxiety of dealing with your audience face to face (whether at a show, an interview or in a video for promotion) but often it is because we forget to use our natural speaking voices. Now, I can’t help you with the anxiety of public speaking, but I’ve found some great resources which can help you find and reclaim your authentic speaking voice, so that you can communicate clearly and confidently. In the last post on social media promotion, we looked at creating a range of content for your various social media platforms. I thought it might make sense, now, to take a quick look at hashtags and how you can harness the possibilities they offer. So, you’ve got a show coming up, or maybe you’re just about to reveal a new collection. Perhaps you’ve updated your website or have an online shop to launch. Quite rightly, social media is going to be high on your list of ways to promote this event, but how to keep it from sounding rather same-y after a while, and saturating your audience with the same information? I am going to let you in on a secret here, one that is going to sound odd coming from someone who spends a lot of her time asking people to write more. The thing is, to write about your work you don’t even have to write at all. Artist's statement dilemma: 1st person or 3rd person? This seems to be a perennial problem for makers. Faced with having to write an artist’s statement, it can be hard to know what to do – use the 1st person ‘I’ or the 3rd person ‘she or he’. Lots of us have been given the advice that the 3rd person sounds more professional and that the 1st person sounds a bit ‘school project’, but I think that’s an over-simplification, and one which doesn’t help with the whole point of writing your artist’s statement: communicating about your work in the best possible way for your work. Does your writing reflect your work? I like to think of words as another material at your disposal. That the writing you create, about the things you make, is just as much your ‘work’ as the physical objects. If we think of writing like this, then it makes sense that your writing should look and sound like the things you make- it should reflect your work.